.Quiltscapes. : Are you up to the Challenge? Home Machine Quilting Show 2016 Design Challenge. Look at this lovely lusciousness. What would you design with these fabrics? Riley Blake Designs has graciously donated fabrics for this challenge. 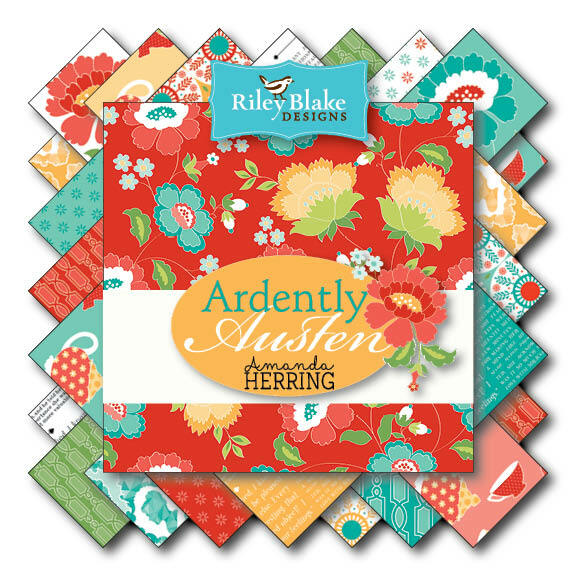 Contestants will receive eight half-yard cuts from Amanda Herring's Ardently Austen fabrics. All quilts in the contest will be auctioned for this year's HMQS charity of choice, the The Christmas Box International, which provides assistance to prevent child abuse and services to improve the quality of life for children who have been abused, neglected or abandoned. Grab a couple of friends and challenge yourselves! And maybe win a cash prize for the effort! Don't miss out! Kits are now being distributed and are going fast. The contest is open to anyone, with the finished quilts due back by April, 2, 2016. Register and see all the details for this worthwhile challenge at www.hmqs.org. When I click the link for details I am asked to login with a username and password to a protected site. Here's a link to the website: www.hmqs.org, then scroll down to "Quilt Challenges".